Retired NIH Research Chimps Should Go To Sanctuaries, If Possible : Shots - Health News A working group convened by the National Institutes of Health looked at where chimps that had been used in research should live now. Unless relocating chimps would endanger them, a sanctuary is best. Since early 2013, 110 chimpanzees have been retired to Chimp Haven sanctuary in Keithville, La., from the New Iberia Research Center in Lafayette, La. That's the largest group of government-owned chimps ever sent to sanctuary. 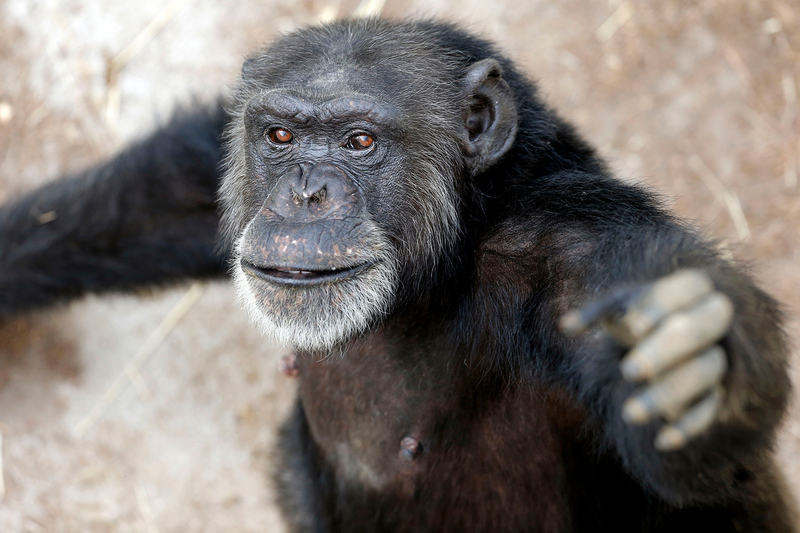 Sabrina, seen here, arrived at Chimp Haven in 2013. Chimps owned by the National Institutes of Health should be moved from research facilities to retirement sanctuaries unless that relocation is "extremely likely" to shorten their lives, a report issued Friday says. "Chimpanzees should be relocated to the federal sanctuary system unless relocation would place the chimpanzee's life, safety, and welfare at extreme risk," says the report from a working group convened by the NIH to examine the safety of transferring chimps to retirement homes. If there's disagreement between a lab and a sanctuary about whether to relocate a chimpanzee, the group recommended that "independent expert veterinary opinion should be sought to inform the relocation decision." The report comes in the wake of a recent controversy about whether moving frail or elderly chimps away from their familiar setting was unduly stressing them and endangering their health. Some animal welfare advocates maintain that Chimp Haven, a refuge of 200 acres in Louisiana, offers the chimps a naturally forested habitat where the animals can enjoy freedom impossible to achieve in a lab. Even though all NIH-owned chimps are housed in social groups with access to the outdoors and climbing structures, advocates say the animals should be moved to sanctuaries. "We are pleased that the working group report emphasizes relocation for as many chimpanzees as possible and we will be pushing to make sure every chimpanzee is relocated to Chimp Haven," says Kathleen Conlee, vice president of animal research issues at the Humane Society of the United States. She notes that "there are numerous examples of chimpanzees thriving once they are retired to sanctuary." But some have argued that old, sick chimps shouldn't be forced to leave their long-term homes and caretakers, and they point to deaths that occurred after chimps were transferred to Chimp Haven as evidence that animals suffered from the change. The NIH has been working to retire its research chimps ever since 2011, when a major study concluded that the use of chimpanzees in biomedical research had become largely unnecessary. As of March 2018, the NIH owns or supports 504 chimpanzees, and 232 already live in the federal sanctuary system. Of the 272 chimps that haven't yet been moved to sanctuary, 177 have chronic health conditions that could potentially increase the risk of health problems related to the stress of relocation, according to the report. The report makes a number of recommendations, including that veterinary records must be shared between the sending and receiving facilities and that both should collaborate "to jointly expand the technical assistance available to the receiving facility to care for at-risk chimpanzees." The working group also concluded that the NIH needs more information in the chimps it owns, saying the agency only had general information. "The NIH therefore lacks the data necessary to proactively assess the health of individual chimpanzees in its colony, track chimpanzees over time, or conduct its own population or actuarial research," the report said. The working group's findings are being presented to the NIH's Council of Councils, an advisory group, which will submit the report along with its own recommendations to the NIH. NIH will then open a 60-day public comment period before the NIH director makes a decision about how to proceed.